Today is a very special day in my life – as well as in my wife’s (that’s Vicki I’m speaking of). Forty years ago today, we got married. It was not your typical marriage ceremony. We were living in Montreal, attending university. We’d also been living together for two years (that’s living together as in “living in sin”, which was not cool in those days. In 1973, we’d been in love for three years and talk of marriage had certainly come up a few times before. Problem was, I was getting a bit of support money from the US government because my dad was deceased, and we really needed it to get by because we weren’t allowed to work in Canada. If we’d gotten married, it seemed the government thought I wouldn’t need the support anymore, so it was an easy (though unpopular) decision to not get married. 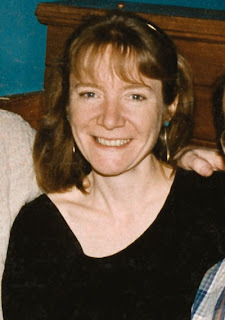 In June of 1973, though, I graduated from McGill and that was when Vicki and I seriously discussed “making an honest woman of her”, as we joked. Marriage in Quebec at that time did not appeal to us, so we decided to cross the border into New York State. One trip was to Plattsburg to get blood tests for our marriage license (why could you possibly need a license to get hitched? ), and to make our trip second shorter, we found a justice of the peace in Champlain, NY, just over the border from Lacolle, QC. So one day, my best friend since 6th grade, Ray MacDonald (sorely missed), and his wife Mary Ann came up from Vermont, and together with our next door neighbour Yusuf Emed (official photographer) and his then girlfriend Marcia Segal, we piled into our panel van and headed south. Turns out our JP of choice, Romeo Filion was more Quebecois than American, way more nervous than us since he was as much a newbie to this marriage gig as we were. His English was also not great, but Vicki (in French) assured him we’d all do fine. Partially smoked. Looks great, doesn’t it? His office was part of the storeroom of his small store (complete with old-fashioned soda fountain), and we got married surrounded by jars of ketchup, mustard and mayonnaise. Romeo was so nervous he read the entire ceremony, and I mean the entire ceremony – including our responses. Neither Vicki nor I said anything about promising to do this or that. (Perhaps this explains why she’s never been good at obeying me.) At the end, though, we each signed the marriage license and we were officially hitched. There was lots more to our adventures that day. At our “wedding picnic”, we had a shotgun pulled on us as we sat under some trees overlooking Lake Champlain. Seems we were trespassing and the farmer’s wife took exception to that. Yusuf, being Turkish and knowing what would make it all better, went over to her. A quiet conversation ensued, some money changed hands, and we were then welcome to use our picnic spot for the rest of the afternoon. So you can say Vicki and I had a shotgun wedding, can’t you? So now you have the background. Today, we’re having a garden party in our backyard to celebrate our 40 years. The weather is going to be lovely and Vicki has the gardens looking magnificent. Everyone invited is bringing something for the meal. We’re supplying the meat: 2 smoked chickens and a home-cured and smoked ham. 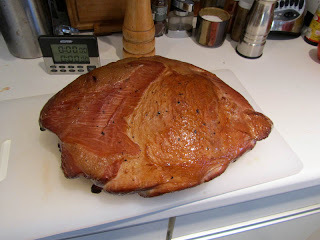 And that’s what I’m writing about today: how easy and delicious a home-cured ham is. Since I didn’t ask Nick Gasparro, our butcher, early enough, we had to buy part of a pork shoulder for this enterprise instead of part of a leg. It’s 9 pounds, has a bit of fat on one side and is a primo piece of pork. Ready to be sliced and served. Boy, that was easy! Curing it was simplicity itself. I made the brine, cooled it down and in went the pork for about 80 hours in the fridge. What came out was a beautiful, firm ham. At this point, it only needed to be heated to around 150° and it would be ready to eat. Of course, that wouldn’t do, so yesterday Karel and I hot-smoked it yesterday. 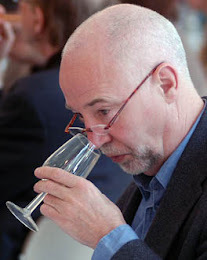 I had used star anise, whole allspice, lemon, and red peppercorns to flavor the brine and they added their distinctive and lovely fragrances to the finished ham. Around the middle of the smoking, I glazed it all over with a mixture of dark brown sugar and Dijon mustard. Tired of store bought salty and flabby ham (since they inject the brine solution into the hams to speed up curing, but equally importantly to increase the weight)? Go to your butcher, get a prime piece of pork from the leg or shoulder and make your own. No chemicals you don’t want, not overly salty and far more lovely-tasting. You will be shocked how easy it is. 2. Add the pork to the brine, weight it down so it’s completely submerged and soak it for 12 hours to the pound (my clarification). We like our pork a bit on the unsalty side so we brined it for 10 hours to the pound. Also, it was very hot this week, so to be on the safe side, I refrigerated everything. 3. When the brining is done, remove the pork and rinse it in cool water, then pat it dry. Place it on a rack for circulation all-round and chill it in your fridge for at least 12 hours (preferably 24). 4. Hot-smoke the ham using apple or hickory (cherry is nice, as well) for two hours. 5. Now glaze the ham all over with a mixture of 1 1/2 cups of dark brown sugar and 3/4 cup of Dijon mustard. Charcuterie recommends adding 1 tablespoon of minced garlic, but we left that out. 6. Continue smoking until the meat registers 155° at its thickest point. 7. Remove the ham from the smoker and brush on any remaining glaze. Let it cool. Now refrigerate it if you’re not serving it immediately. If you are serving it immediately, make sure to let your ham rest for at least 30 minutes to draw the juices back to the center. 8. If serving later, take the ham from the fridge and place it in a 275° oven until the center is warm (test it with a skewer). Slice and serve. 9. Be amazed at the number of compliments for something so easy! Oh, and Happy Anniversary to my dear wife, Vicki Ann Woolsey, who has been the best companion imaginable for more years than I feel comfortable acknowledging. She is amazingly beautiful, vibrant, and I still love her dearly. this is amazing, I love hum, all kinds of it but i'm not sure if I can pull this off on my own lol im not a great cook.. well only in restaurant games perhaps lol but the real stuff is too tough for me... I'll give it a try anyway and let u know how it goes :P thank you very much! You don't have to be a great cook. Just follow the instructions precisely and you'll get a great result. It's pretty easy. If you don't want to smoke it (even easier) just put your cured ham in a 275-300 F° oven until the internal temperature reaches 155F° and you're done! Is it supposed to be covered with foil or uncovered during the reheat in oven process? I would leave uncovered -- mostly because of the glaze. 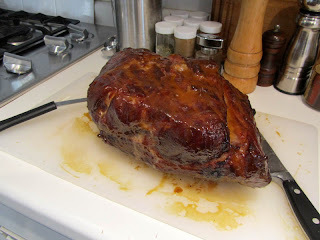 Now if it's a really BIG ham, I would probably cover it with foil for half of the reheating. One good hint would be to take the ham out of the fridge a few hours before heating it (after all, it's fully cured and wouldn't be dangerous) which would mean it would heat up faster and dry out less. Now you've got me thinking that it's high time we made a ham!